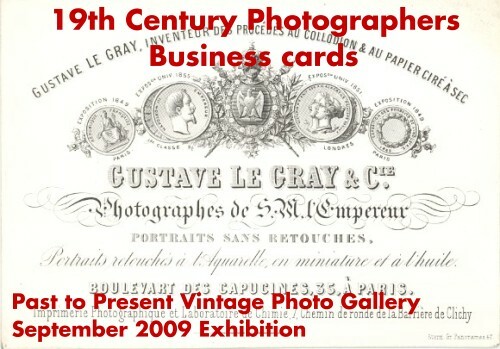 Our September 2009 exhibition features a small group of business cards from nineteenth century photographers from the archives of famous parisian printer and engraver Stern. This group includes several rare porcelain cards. The cards were popular in Belgium in the middle of the 19th century but have only been produced for a short time in France after it was proven Cerussite used in making these cards was dangerous for the persons manipulating it. A new exhibition is added every 2 to 3 months, depending on our inventory and new acquisitions. The subjects we plan to showcase next are photos by Seeberger Freres (Jules Louis, Henri) and World War II Japanese propaganda photos.